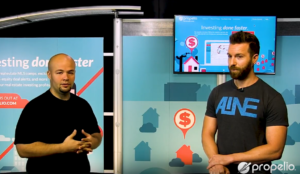 Brandon Richards is a Texas Real Estate Agent and Real Estate Investor known as “The Connector.” Propelio’s Daniel Moore talks with him about how he got started, his first few deals, and what advice he can give to other new real estate investors. Being both a real estate agent and real estate investor has its advantages. Brandon explains that sometimes he goes into a deal as a real estate investor, but can help the seller more as a real estate agent. Recently in Frisco, Brandon did just that – went to buy a home as an investor, but after talking with the seller, listed the home as an agent instead. Brandon still made a profit and the seller ultimately got more money in his pocket to help with bills and the next steps in their life. He explains that you have to talk to people, listen to the “seller’s needs, find his motivation, time frame, and the urgency.” Then you can decide, as a real estate investor, what you want to do – set a price or walk away. Or, in Brandon’s case, help the seller list and sell the home traditionally. Of course, the home in Frisco wasn’t his first deal. His very first wholesale real estate deal was a direct sale deal known as “The Roach House.” This home’s seller had quite a few liens. The house was free and clear, and the seller just wanted the debt gone and to move out. The ARV on the 2006 home was $185,000 plus, and the seller was asking to cover the debt, plus an additional $20,000 – $25,000. Brandon jumped on it – what a great deal! But … what was wrong with it? Well, he doesn’t call it “The Roach House” for no reason. And if you want to see why, you can view the video of the walk through on his Facebook page here. In the end, Brandon did very little rehab on the home and sold it to another real estate investor. Brandon says he made about $42,000 on the house – his very first wholesale real estate deal. So how did Brandon find this lead? It was on a pre-foreclosure Propelio list. “That’s why I got Propelio,” Brandon states. Mailers and lists are really the only tools he uses, and he only needed a couple of weeks to get a good lead. He says other real estate investors usually market to real estate agents, use bandit signs, network, or cold call. “That’s just not me,” Brandon explains, and when people are in pre-foreclosure, or a bad situation, they don’t want to talk to anyone because it can be embarrassing. Instead, he finds sending a mailer and having people input information online is much more comfortable for everyone involved. Even his current rehab home came from a direct mailer. The seller set a meeting with him and 3 other real estate investors. She had a stack of cards, and she called to see who could offer her the best deal. Again, Brandon sat with the seller, listened, and had the same conversation he has with all sellers to find their needs, wants, motivation, and urgency. Finding out those things allowed him to create an offer ideal for everyone. Being a fairly new wholesale real estate investor, where did Brandon get his funding? How could he afford his first buy? Brandon says he was fortunate enough to have another investor help him set off on his own. But when he got started, he admits he was broke. So he watched, learned, and built a network. Brandon explains that about a year and a half ago he moved from Arizona to Texas. He came with only $1300. He just assumed he could be a regular real estate agent, but getting the license switched from Arizona was a bigger challenge than he had anticipated. Then he found being a regular broker tough, and it just wasn’t working out for him. He had actually learned about “no money real estate investing” from a friend before he left Arizona. Of course he was interested, but he didn’t put any time or effort into becoming a real estate investor until he realized he wasn’t happy and needed a change. So he bought books, did the research, listened to podcasts, and followed other real estate investors for tips and advice. “So no formal investment education?” Daniel asks. “No. No experience, no training.” Brandon says. “And on your very first deal you made a $42,000 check.” That’s not a bad lifestyle change, Daniel boasts. Brandon chuckles and agrees, and goes on to say the actual buying process didn’t take too long, actually, about a month. Sure, it took a bit to learn how to get started, but once he had everything in place, he sent direct mailers in January of this year, and got his first deal done in February. Daniel agrees, saying he’s seen so many people invest time into educating themselves, then quit, never following through to the next step of actually making a deal. Brandon expands by saying when people are scared to do things they don’t like, for example cold calling, not relying on a weekly paycheck, or making mistakes, then they stop instead of moving forward. He concludes that people are scared of making mistakes, but that’s how you learn. “Mistakes are the only way to make it forward,” Daniel seconds. He goes on to say, “[Making] mistakes means you tried something you didn’t know how to do; if you failed you gained experience.” And that’s how you become successful. Brandon’s mistakes so far may have cost him time, money, and in some cases friends, but he’s also learned what not to do in the future. More importantly, he’s learned you have to make mistakes, because without mistakes, you’re not going to get it perfect. So when it comes to real estate investing, what’s the biggest mistake Brandon’s made? For wholesaling, it was “Not doing direct mailers first.” He explains when you network, find buyers, or other real estate investors, that’s great, but he feels it just doesn’t generate leads. As for rehabbing, he’s learned not to “short cut anything” and to “go with your gut.” If you feel like someone is not going to do what you expect, don’t bring them in, and find someone or something else to get the job done. And don’t give money to people first, especially contractors. Daniel laughs and agrees, and moves on to find out what Brandon has sacrificed to become successful. He also explains he is making an effort to create more time to spend with his family, and is doing so by formulating his own systems to become efficient. Daniel adds that when you start real estate investing, it does take time. But the harder you work, the quicker you can build your business and take more time for yourself. Daniel adds being honest about how time consuming starting out is, is good for any new real estate investor to hear. Brandon goes on to explain how he’s cut out time wasters, like TV, or going out, so he can focus on work and family. So what’s next for “The Connector,” and what are his long-term goals? Brandon admits he’s not good at setting goals, and he doesn’t know what the future holds. But he does know he enjoys rehabs. However, wholesale real estate investing is where you can make more money faster. He also knows he wants to be able to do multiple flips at a time and build a house by the end of the year. Finally, besides money, Daniel wants to know what Brandon thinks is a real estate investor’s best benefit? If you have questions, or would like to work with or network with Brandon, you can get in touch with him through his Facebook page at facebook.com/brandon.richards1212. He’s always looking for real estate investors, deals, wholesalers, private money, people who can help him, or people who need help. Even if he can’t work with you, he maybe able to connect you with someone who can help you, or at the very least, motivate you and help you learn from his mistakes. If you’re a real estate investor and you want to use the tools Brandon uses, sign up for Propelio today! For more tips from pros, subscribe to our YouTube channel and follow us on Facebook.